Circular BarbellsThere are 328 products. 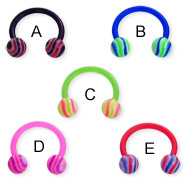 Gauge (Thickness): 14 (1.6mm) Material: 316L surgical grade stainless steel Material: acrylic Material: crystals Type: circular barbell Show: 14mm circular barbell with 5mm balls. Gauge (Thickness): 12 (2.0mm) Material: 316L surgical grade stainless steel Material: acrylic Material: crystals Type: circular barbell Shown: 13mm horseshoe barbell with 5mm balls. 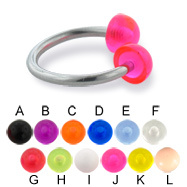 Diameter: 1/2" (13mm) Gauge (Thickness): 10 (2.5mm) Material: acrylic Material: surgical grade solid titanium Type: circular barbell Shown: circular barbell with 6mm balls. Gauge (Thickness): 12 (2.0mm) Material: acrylic Material: surgical grade solid titanium Material: crystals Type: circular barbell Shown: 13mm circular barbell with 5mm balls. Gauge (Thickness): 14 (1.6mm) Material: acrylic Material: surgical grade solid titanium Material: crystals Type: circular barbell Shown: 13mm circular barbell with 5mm balls. Diameter: 1/2" (13mm) Gauge (Thickness): 10 (2.5mm) Material: acrylic Material: surgical grade solid titanium Type: circular barbell priced and sold individually Shown: horseshoe barbell with 6mm balls. 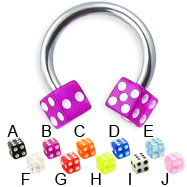 Gauge (Thickness): 12 (2.0mm) Material: 316L surgical grade stainless steel Material: acrylic Type: circular barbell Shown: 13mm circular barbell with 5mm dice. 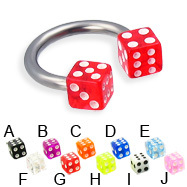 Gauge (Thickness): 14 (1.6mm) Material: 316L surgical grade stainless steel Material: acrylic Type: circular barbell Shown: 14mm circular barbell with 5 mm dice. 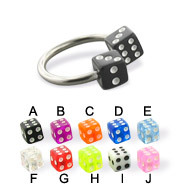 Gauge (Thickness): 12 (2.0mm) Material: acrylic Material: surgical grade solid titanium Type: circular barbell Shown: 13mm circular barbell with 5mm dice. Gauge (Thickness): 12 (2.0mm) Material: acrylic Material: surgical grade solid titanium Type: circular barbell Shown: 13mm circular barbell with 6mm balls. Gauge (Thickness): 12 (2.0mm) Cone size: 3/16" (5mm) Material: acrylic Material: surgical grade solid titanium Type: circular barbell Shown: 13mm circular barbell. 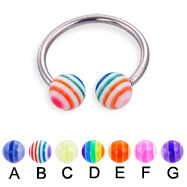 Gauge (Thickness): 12 (2.0mm) Material: 316L surgical grade stainless steel Material: acrylic Type: circular barbell 6mm acrylic half ball Shown: 13mm circular barbell. Gauge (Thickness): 14 (1.6mm) Material: 316L surgical grade stainless steel Material: acrylic Type: circular barbell 6mm acrylic half ball Shown: 12mm twister. 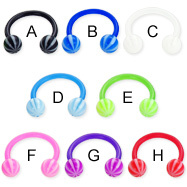 Gauge (Thickness): 12 (2.0mm) Material: acrylic Material: surgical grade solid titanium Type: circular barbell 6mm acrylic half ball Shown: 13mm circular barbell. 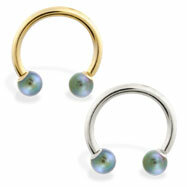 Gauge (Thickness): 14 (1.6mm) Material: acrylic Material: surgical grade solid titanium Type: circular barbell 6mm acrylic half ball Shown: 13mm circular barbell. 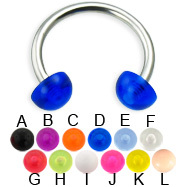 Diameter: 1/2" (13mm) Gauge (Thickness): 10 (2.5mm) Material: acrylic Material: surgical grade solid titanium Material: crystals Type: circular barbell priced and sold individually Shown: circular barbell with 6mm balls. Gauge (Thickness): 12 (2.0mm) Material: acrylic Material: surgical grade solid titanium Material: crystals Type: circular barbell Shown: 13mm circular barbell with 6mm ball. Gauge (Thickness): 14 (1.6mm) Ball size: 3/16" (5mm) Spike size: 5/32" (4mm) Material: 316L surgical grade stainless steel Material: acrylic Type: circular barbell 9/16" (14mm) spike length Shown: 14mm circular barbell. 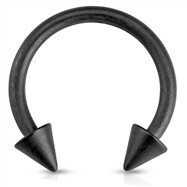 Gauge (Thickness): 14 (1.6mm) Ball size: 3/16" (5mm) Spike size: 5/32" (4mm) Material: acrylic Material: surgical grade solid titanium Type: circular barbell 9/16" (14mm) spike length Shown: 13mm circular barbell. Gauge (Thickness): 12 (2.0mm) Cone size: 3/16" (5mm) Material: 316L surgical grade stainless steel Material: acrylic Type: circular barbell Shown: 13mm circular barbell with 5mm ball. Gauge (Thickness): 14 (1.6mm) Cone size: 3/16" (5mm) Material: 316L surgical grade stainless steel Material: acrylic Type: circular barbell Shown: 14mm circular barbell with 6mm ball. Gauge (Thickness): 14 (1.6mm) Material: 316L surgical grade stainless steel Material: acrylic Type: circular barbell Shown: 14mm horseshoe barbell with 6mm balls.